First day of Celebrate Dance! Event. Participants and instructors started trickling n checking into hotel. Everyone mingled and chatted happily, registered n started dancing!! The self-made floors were great and got great commendations! First day of workshop. Quite nervous to teach with the big names like Scott, Rachael, John, Michele, Joanne, Gerald, Judy, Donna, Vivienne, Zandra, Double Trouble and Amy. workshop started off with previews of danced to be taught today. Attended few classes and taught Sweetie (Niels), Aces Go Places and Hey Ladies. Evening came and it’s time to party! There was a quick preview of the dances to be taught on Sat & Sun. Party until wee hours of the morning!! 2nd day of workshops. Lots of dances lined up for today. Started wt Zumba Gold by Joanne Brady. Attended more classes today and taught Chilly Cha Cha by AT Kinson as a classic. As there were still time, the students requested for Hey Ladies as they had missed it yesterday. Then taught At This Moment which was the crowd favourite. There’s a special dinner in the evening, followed by a special show by 5 performers: Amy did a classical Indian dance, Michele Perron did a west coast swing with her husband Brian. Then comes my turn to performed Innuendo which was the dance that got Carmen and I acquainted. Next Robert sang the song he used to sing to Carmen when they were courting: Elton’s Your Song. The show’s finale was an amazing waltz performance by Rachael. The whole show was highly emotional as everyone remembered Carmen so there were lots of tears. The night continued with more open dancing till wee hours in the morning! Woke up sore… Its very cold today and we have to do the laundry from the whole week. Met Winnie Yu & her gang for lunch and did some shopping at Pacific Mall. Then we had dinner with Anne, Show Ming, Alice & Polly and a ladies night out after that at Anne’s – painting nails! Woke up to finish packing (laundry not fully dried) and we head off to Burlington again to return the audio equipments. Then we left Toronto for Niagara Falls which is another hour’s drive from Burlington. The Falls were truly majestic and beautiful but the cold wind doesn’t allow us to stay out too long. And no rainbow as there was no bright sun 🙁 We drove to the falls again at night to watch it in coloured lights. 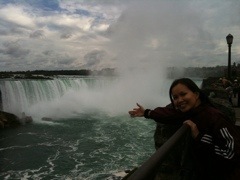 Spent the night in Niagara as we’re heading off to USA the next day. Before driving across the border, we took a drive to the Niagara Whirlpool. Again it’s so cold and rainy! Then we drove across Rainbow Bridge to Buffalo USA. Took a flight to San Francisco and transit at Atlanta. Met another group of line dancers from Toronto in Buffalo Airport and South Africa in Atlanta. Wow, we can’t wait to get there!! Congratulations…. on a great trip and so much FUN..